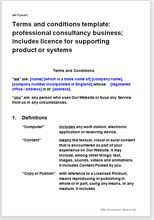 This is one of three consultancy / professional Net Lawman terms and conditions documents which could be used either as website T&C or as a hand out to a client. Not suitable as a negotiated document (for which, see below). All three are for a business model where a professional service uses a website to promote the business. sell a service supported by a product or device. This is a little more complicated because either you license your product or you sell it. In the first instance your T&C should include the terms of the licence. Services, supported by the sale of some physical product, even a dvd or hard copy materials. That is at T&C consultancy: professional or expert service; sale of supporting products. Services, where your expertise depends on intellectual property which could be used in ways you do not wish to allow. That is this agreement. you provide environmental hazard assessments and permit your client to use your copyright systems and materials. you provide children’s tutorial or sports training services. You wish to make clear to parents that your materials may not be distributed to school friends. you are an engineering consultant with your own copyright systems which are used by your clients. You wish to set the limits of how they may use your materials. a service for which you respond to Internet enquiries and give a quotation. The agreement provides for situations where the advice or service given is supported by some licensed product, whether an entire factory management system or simply some device for measuring the temperature of rain drops. The licence provisions are very strong, with many options. Contains strong provision for confidentiality and protection of your intellectual property, - we assume you may use texts or software of great value. Over 1,500 words of helpful drafting notes.